Comparing the 2D Web to 3D multi-user, immersive virtual worlds can be tricky, and some might consider it like comparing apples with oranges or comparing the experience of reading an online health information leaflet to that of having a face-to-face meeting with a clinician. The affordances of both media are different; they are also not mutually exclusive or a substitute for one another, but rather very complementary and synergistic in many ways. We need to especially identify and focus/capitalise on what 3D virtual worlds are best at--those (useful) things/scenarios that can only be effectively carried out in virtual worlds and not via any other 'e' medium (as effectively), and also determine the optimal formulae for blended approaches that combine 2D and 3D media. Online leaflets and static information materials have no social component--even those materials offering single-user interactivity or asynchronous, multi-user (predominantly textual) interactivity remain seriously lacking in this respect. Second Life, on the other hand, is about 3D social networking par excellence; it has this unique 'human touch' and is instantaneous, something not found (in a similar way) in 2D social networking sites like MySpace and Facebook or in instant messaging/voice chatting services like Paltalk. Second Life is closer in many respects to face-to-face/social encounters, but also adds to them many exciting new dimensions, fantasy, and virtually endless possibilities--you name it. 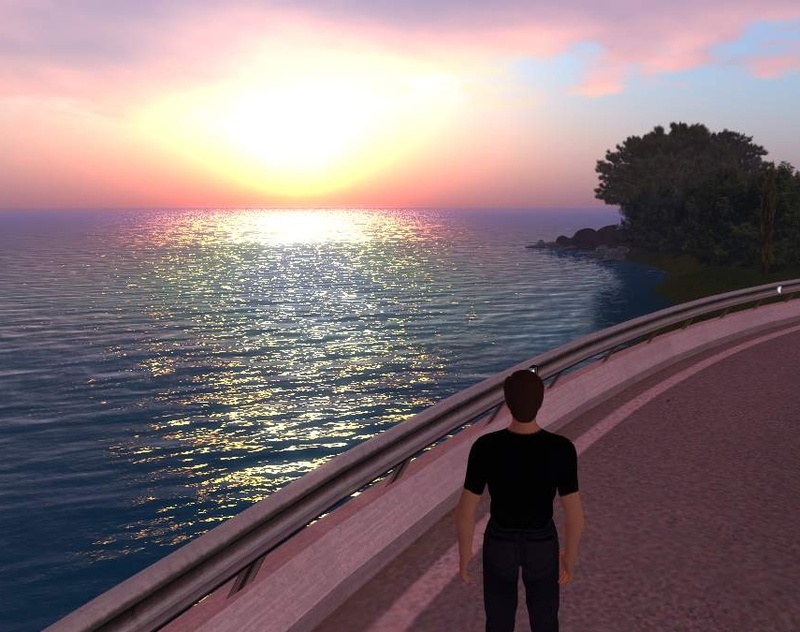 And let's not forget that Second Life is a collaborative 3D wiki and an immersive audio-visual spatial experience that users can edit, experiment with, and see the changes in real time! People also have different tastes/preferences and currently the audiences of the 2D Web and the 3D Web/Second Life are overlapping but still different (read the US CDC arguments about this: "going where people are... yet another opportunity to learn and teach about public health"). Furthermore, and in support of the above mentioned potential complementarity and synergy between both media, we are starting to see the 2D and 3D Webs gradually converge and merge; see, for example, the Flux project, this blog article and this application. So 3D virtual worlds are here to stay and eventually become one with/tightly and seamlessly integrated with the 2D Web over the coming months and years (rather than replace the 2D Web). Indeed, a recent futuristic/visionary American report entitled VISIONS 2020--Transforming Education and Training Through Advanced Technologies suggests that by 2020 (or before) we will see new jobs like "simulation and virtual environments engineers who build and maintain the components for synthetic environments, including specialised scientific software, e.g., a digital human that can be used for a variety of learning situations; specialists in building the components of simulated towns, instruments, landscapes, biological systems, or physical phenomena". Why 3D? This is not a full answer, but just some thoughts. Realism is key to believability and immersiveness. The differences between reading a book, seeing the movie, and watching the same movie in 3D HD (High Definition) are evident. The latter feels more easily and naturally like 'being there'. However, it is not until you are actually ("yourself") inside the scene, participating and interacting (again in a realistic and natural way), that your sense of 'being there' is "complete". We are spatial beings, living and interacting in a 3D (real/analogue) world. Our voice communications are even spatialised (being able to discern the direction of voice/sound sources around us), and that's how the blind find their way in computerised 3D spaces. We need a "true" space to move in and a true sense of 'connectedness' to, and awareness of, others who happen to be in the same computerised space while we are there. The ability to invite buddies where one is in a virtual space (teleporting), to see and share what one is doing/looking at, is very natural and handy. WebEx 2D vs. 3D - http://blog.openitstrategies.com/2007/03/webex-2d-vs-3d.html; etc. The message and the vehicle--technology should be a servant, not a goal: A richer 3D multimedia environment will not always result in more effective information acquisition and learning. In a study published in 2007, Rockwell and Singleton found that participants who viewed a text-only presentation scored significantly higher in a free-recall quiz than participants who viewed the same material in a text-audio-video presentation. 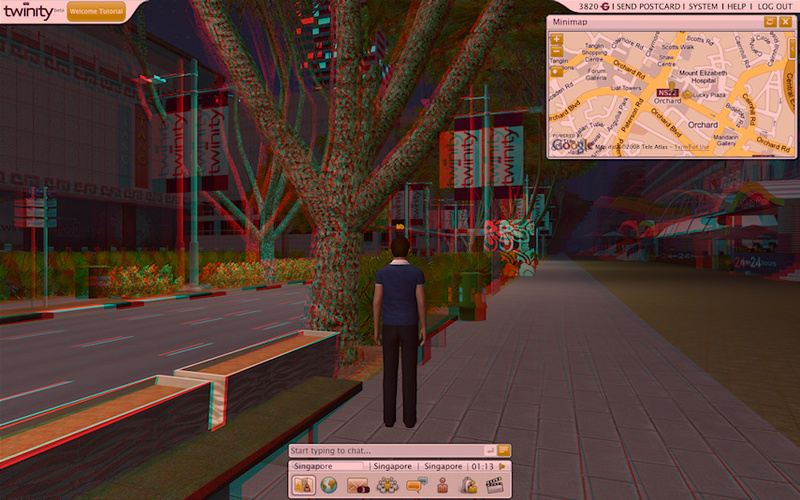 Although there are many personal learning styles, preferences and other factors that may account for these results, a key lesson to learn in the context of 3D immersive worlds is that 3D 'bells-and-whistles' have to be cleverly designed in such a way as to enhance and reinforce the message to be delivered rather than get into the way of that message by acting like a 'distractor', drawing users' attention away from it and onto the technology (or 'message vehicle', including 3D client user interface that can add to user's cognitive load, leaving less attentional capacity for the main message). The message of a any given 3D presence must not become too eclipsed by the cutting-edge technology used to deliver it. Technology needs to be transparent, almost invisible. You feel its presence, but you don't see it. Technology has to prompt curiosity but remain discrete, so that one can fully focus on the message of the 3D experience. This is also key to successful immersiveness (suspension of disbelief). 'Reinforcing the message' can also be helped by adequately capitalising on the social and communication affordances of 3D worlds. 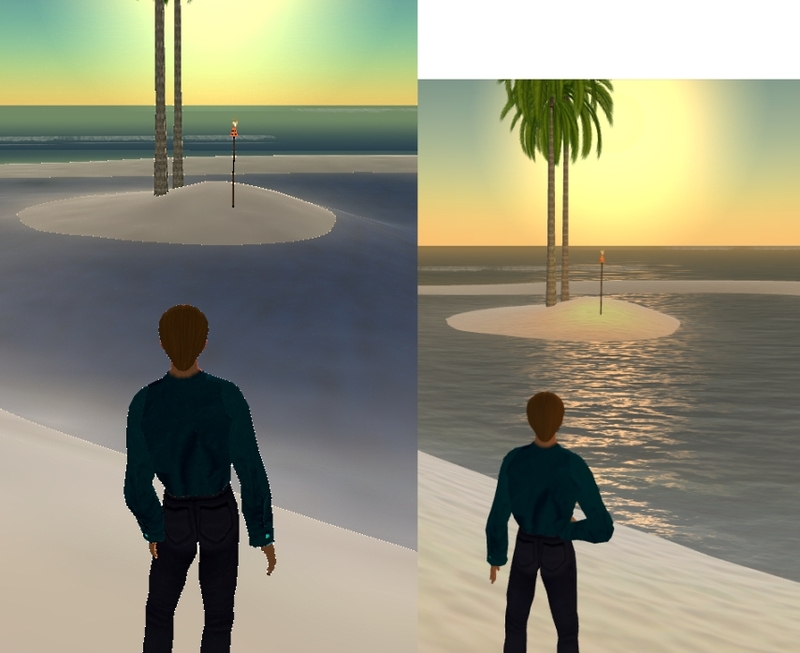 ‘A tale of two graphics cards in Second Life’ - Left: low-end Intel GMA 900 card (64 MB shared graphics memory); right: high-end NVIDIA Go 7 series card (with 256 MB dedicated graphics memory). Note, for example, the lack of anti-aliasing, bump mapping and ripple water/sunlight reflection in the low-end card rendering of the scene. In-world speed and smoothness of movements are also affected, but this cannot be shown in a screenshot. And the WindLight version of Second Life requires an even more powerful graphics card to cope with the ‘Ultra’ quality graphics settings (in Second Life’s ‘Preferences’), with all ‘Atmospheric Shaders’ and ‘Water Reflections’ enabled! 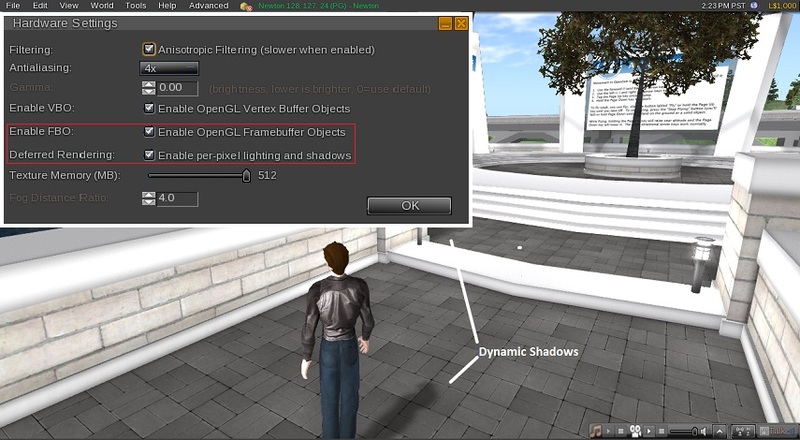 Dynamic shadows in Second Life (click above snapshot for YouTube video). Because it supports fullscreen (non-windowed) DirectX mode, Twinity can be rendered out-of-the-box in S3D (stereoscopic 3D), if the user is running NVIDIA 3D Vision (Discover/anaglyph or full with shutter glasses). This snapshot is the Discover/anaglyph version (requires suitable red/cyan glasses for proper S3D depth viewing). It is also noteworthy that Twinity uses COLLADA (COLLAborative Design Activity - an interchange file format and standard for interactive 3-D applications) as its 3-D model and animation format, enabling 3-D content developers to easily re-use COLLADA models created in popular 3-D modelling tools such as Google SketchUp. Compilation © 2006, 2007, 2008, 2009, 2010, 2011, 2012, 2013, 2016 Maged N. Kamel Boulos/HealthCyberMap.org. All Rights Reserved. Linden, Linden Lab, Second Life, Second Life Grid, SL, SL Grid, SLurl, and WindLight are trademarks of Linden Research, Inc.